Nothing brings me home like the sweet and savory flavor of an oven-roasted chicken cooked with a combination of fruit and vegetables. It reminds me of sitting at the table at Grandma’s house while trying to swallow down an impossible portion because she measured her love in food. As you may already know, I’ve been cooking my way through Jerusalem and this dish competes for every other one I’ve made so far for the “best dish” in the book. 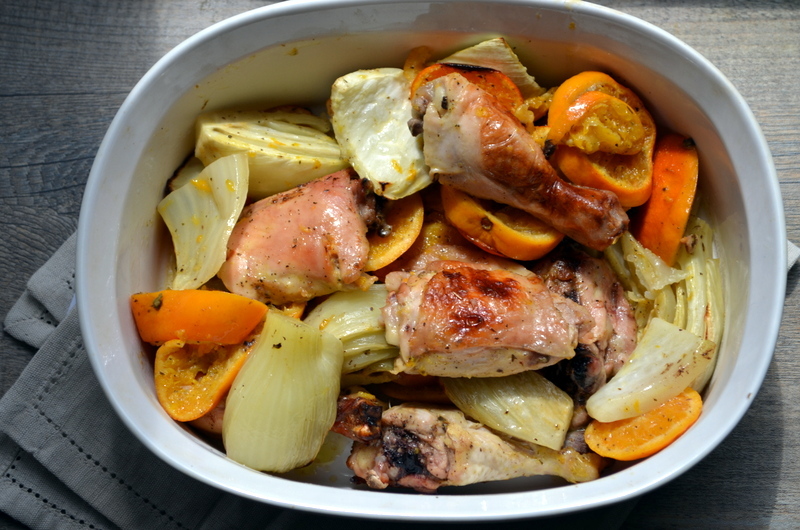 This poor chicken is bathed in a sea of luxurious flavors, from a couple of shots of flavorful booze to fennel bulbs, a splash of lemon, whole clementines and then laced with a rustic infusion of fresh thyme. Just when you think you’ve rendered all the flavor you possibly could from this dish, as the chicken and vegetables gain a slight char, the recipe calls for a reduction of the cooking liquid for a more concentrated fruity gravy. Mix these 6 ingredients together in a bowl to make the marinade, and set aside. 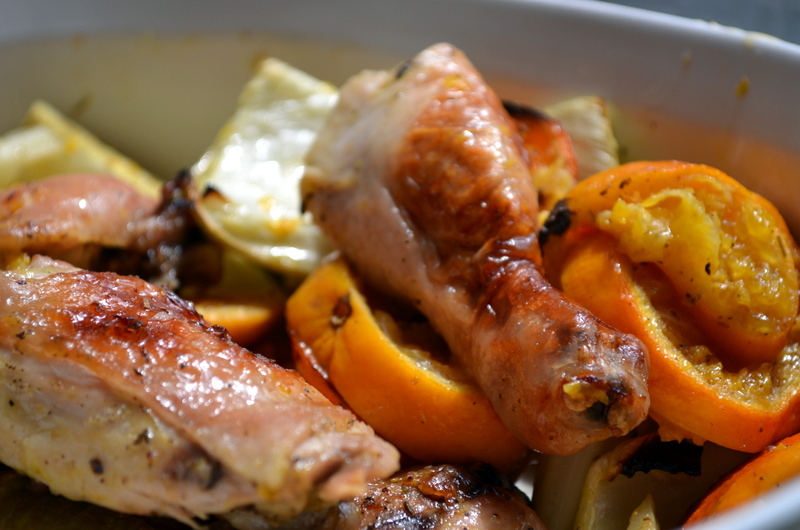 In addition to the first six ingredients in the mixing bowl, add the sliced clementines with the chicken pieces and the fennel. Pour the marinade over everything in the bowl and mix with your hands until everything is well coated. Pour all into a large rimmed baking sheet or pan and sprinkle with the thyme, kosher salt and pepper. Everything should be snug, but sitting comfortably in a single layer, with the chicken skin side up. Insert it into the preheated 475 F oven for 35-45 minutes until there is a slight char on the vegetables and the chicken. When you take the chicken out, pour the cooking juice into a sauce pan on medium to high heat and reduce to about 1/3 cup. This will enhance the flavors. Move the meal to a serving dish, pour the liquid over it and serve. This is stunning. So many wonderful flavors all together. And such beautiful colors! Thanks, Eliza. The dish is such a classic. I think every culture has a version of this with different fruits and veggies in it. Very yummy! How long do you roast (?) this – at what heat? My goodness! I forgot to add that. You roast at 475 for about 35 to 45 minutes. The higher heat is to get it slightly charred. I just added it to the post. Thanks for that! The clementines are a bit of a surprise. I have never thought to add them before reading your post. They’re delicious. I’ve done it with oranges and even apricots before. 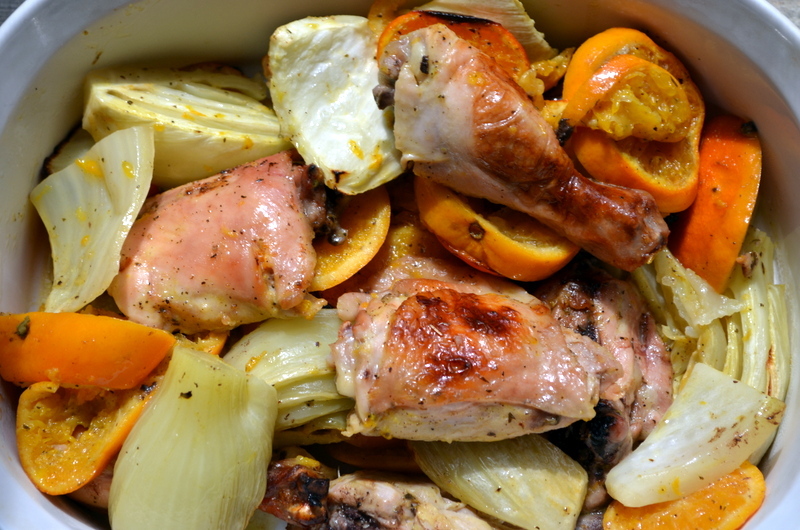 Sometimes I’ll layer a pan with dried apricots and put the chicken on top then make an apricot preserve marinade. 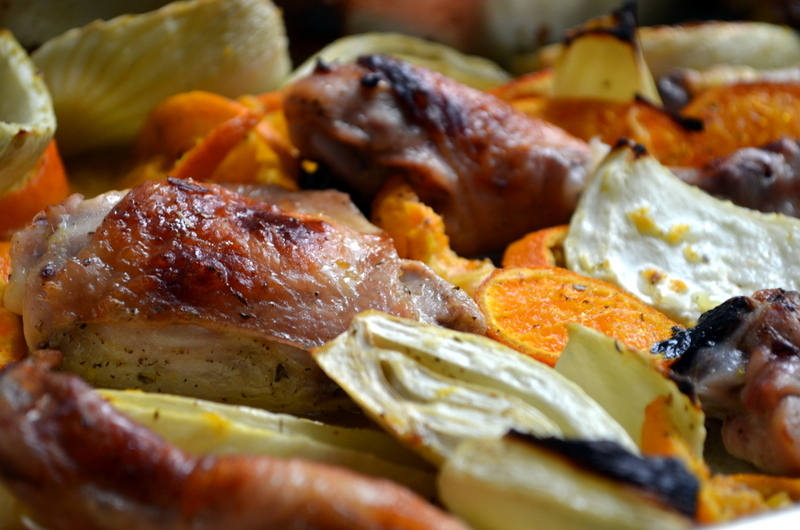 So many ways to roast chicken! Lovely. I’m also cooking my way through Jerusalem at the moment, haven’t made it this far yet. I hope you’re loving it as much as I am! Even if you only do a recipe here and there, there’s so much to learn so that you could do something similar on the fly. I don’t think I’ve ever cooked as much from a book and everything has been lovely, except the pearl barley risotto which was just ok. I agree that I’ve never cooked from front to back of a book before and loved almost everything in it. Instant classic.